TTC after loss brings about a whole new range of emotions to deal with and when infertility is added on top of this, it can seem insurmountable and can be incredibly painful. The loss of our Ava Grace and the trauma I was still feeling almost 18 months later was very raw. Deciding to add to your family is a difficult decision because you know that no baby will ever be a replacement for the child that died but there is a gaping hole that you can feel desperate to fill. In our case IVF turned out to be the path we walked. The path to IVF can be very daunting and it took quite some time before we took that step. It was definitely the right one though and was nowhere near as hard as I was expecting, I think because I was so used to Fertility Clinics procedures after undertaking 17 assisted conception cycles (also known as ovulation induction) I was pretty much swapping tablets for a few needles a day and of course adding in two day procedures (the first of which was not pleasant at all). I feel that these cycles helped prepare me for the IVF process. We had changed to a much more affordable clinic for IVF as the thought of being financially ruined after every failed cycle as well as being emotionally messed with was not something we could get our heads around. I had a good friend recommend Westmead Fertility Centre and I am so glad she did, even though it meant a much further drive for treatment and appointments! Dr Ashley Fong was very understanding and compassionate about our loss of Ava and went through our whole history which included endometriosis and adhesions which had included 3 surgeries, PCOS, AMH levels which seem to change every single time I have had that blood test done, a blocked tube due to an undiagnosed ectopic pregnancy as well as looking at my previous response to Fertility Medications, which years ago had worked well, though not when trying to conceive our Ava and longed for rainbow baby. I think for many women the thought of giving yourself needles can be one of the hardest parts of IVF. I knew my husband would not be able to do them for me as he is needle phobic and goes pale just talking about them! So it was up to me! During my nurse appointment and subsequent day that needles began the nurse demonstrated to me and talked me through the process. I had decided to schedule the needles in the morning so if I found that I really couldn’t do them myself I could always go to the clinic to have a nurse do them for me. I can remember her telling me the Gonal F needle feels like a knife sliding into butter and when I did it I would have to agree! It really didn’t hurt, although luveris was a much harder needle to do and stung as well as the orgalutran. I just kept telling myself short term pain for long term gain and that I wouldn’t be looking back and regretting it once I was holding our baby in my arms. The day of egg pick up arrived and I was really sick with a heavy cold and was scared they wouldn’t go ahead which would be a waste of a cycle and money down the drain. I also do not respond well to anaesthetic but the anaesthetist was amazing going over my previous reactions and what medications I had been given beforehand so she did everything she could to prevent this. My husband went off in one direction of the hospital to play his part and I went to my part of the hospital where I waited and chatted to other women waiting for their turn. I was quite surprised that all of the women there waiting looked relatively young, I know that IVF is often thought of being used for older women but it just demonstrated that infertility can affect anyone at any stage of their life, not matter how young or old or healthy or unhealthy they are! I was taken in and met the doctor who would be doing my EPU and was put to sleep very quickly. When I woke up I was in recovery and in pain and out of it but awake enough to check my hand for how many little eggs they retrieved which was more than they had told us to expect. I was finding it difficult to breathe so had oxygen and fluids via an IV and more pain meds and was then moved to the sitting waiting area, where not long after I fainted (for those that know me they won’t be surprised). This happened within seconds of my husband arriving and me holding up my hand grinning while telling him about my little eggs). The nurses got me into a wheelchair and back to the bed where I proceeded to faint again. A little more oxygen and talk of keeping me in overnight and I came good after being violently sick ridding my body of the pain meds that I reacted to. One of the scientists came and saw us and explained that my eggs looked good and what the next stage in the process would be. I was really disappointed knowing we wouldn’t be able to do a fresh transfer 5 days later due to one of my hormones rising too quickly but I understood this was also to make sure no viable embryos were lost because of it. A phone call the following day told us how many embryos were created through the in vitro fertilisation process which had all gone well so far. Our embryos were now going to be frozen. My hormones are always all over the place so I had to do a medicated cycle for the Frozen Egg Transfer. I also had to wait almost two months which felt like years. Finally the time came for that cycle to start and I was taking medication that I had taken before for many times during ovulation induction cycles (letrozole). However for some unknown reason for the first time I had no response to it, the cycle looked like it was going to be cancelled. After speaking to my FS it was decided I would start doing injections again to try and get my body responding how it should. So again I started jabbing myself and finally it worked after a very long cycle and an ultrasound where my ovary was not seen till the last minute and it was time to trigger (with another needle at midnight). 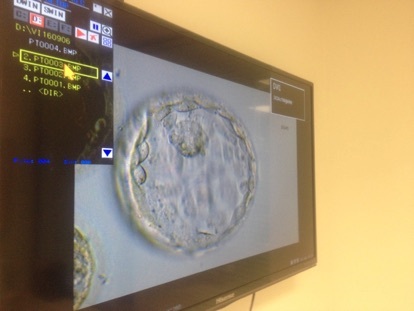 Transfer was the following week, it was a quick process and was quite amazing seeing our embryo on the screen. I was sad to hear that some of the embryos had died off in the first 2 days of the thawing process but the one being transferred looked as good as they get and we were given an excellent chance of it sticking! Even with this information I was still very pessimistic and was talking to our FS about how soon we could transfer again if this cycle failed. I think when you have had so much disappointment and delays during fertility treatment it is only natural to feel like this. The procedure was over before I knew it and we were back home again. For those who know me, know I am a a serial tester when it comes to pregnancy tests. You are told the day that you are supposed to test with a home pregnancy test, however I cannot handle the suspense and would rather know early if I think worked or not. I had taken a trigger shot needle which is the HCG hormone so can give false positives. I tested that trigger out every day until it was gone, then after one full day of seeing no double lines, the next day was the faintest line. I didn’t really believe it so of course I did about 4 other tests that same day with various brands of HPTD. This continued until the “official test day” where I already knew the answer! I was pregnant with our rainbow baby! This led to a mixture of feeling overjoyed and so grateful yet terrified at the same time as I knew very well that a positive pregnancy test unfortunately does not equal a live baby screaming in my arms 9 months later. This journey didn’t end here, but the IVF process seems so long ago. Now as I look back and reflect it was very difficult emotionally, as you feel like you have little control over anything (which for me is very difficult). People also have their own views on IVF and I had to ignore these and go ahead with what we felt was right for our family and in the end had such a peace about it. A rainbow pregnancy (a term used in the babyloss community for a pregnancy after loss) is always going to be hard and full of emotions, however at the time I was completely unprepared of what was ahead in the coming weeks and months but nevertheless this is where our rainbows journey began and we are truly blessed and grateful to God for modern science and technology to help us complete our family.